With the demise of my favorite website for Pączki Day, which consisted of polka music and a single pączek with red and white light emanating from it that squawked /PUNCH-key/ every time you clicked on it, I’m sorry to say the day is a bit glummer. 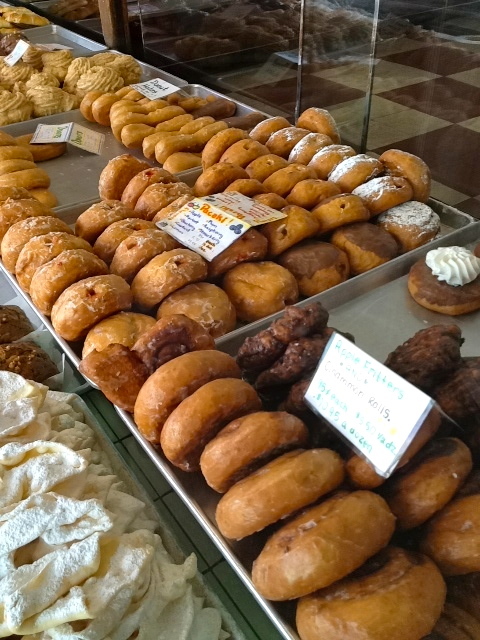 I celebrated the past 7 years by punching that key dozens of times every Pączki Day morning, and celebrated it by sharing with you. There’s this song, a joyful romp down the main street of Hamtramck, the Polish neighborhood in Detroit, but it just fails to compare. And since I teach on Tuesdays, I can’t even spend the day in mourning by making pączki with my newfound zest for yeasted doughs. Oh well. All good things must come to an end. Buy a donut, Eugene, and poke it for me. Pączki! Pączki! Pączki! Spring is here, and with it my mineral longing, my complex bitter plant craving. It’s the only time of the year I like salads because I can populate them with dark and tender baby leaves that burst with vitality. And I gorge myself on raab and the similarly budding fresh new tops of flowering brassicas like kale, brussels sprouts, and collards. I was turned on to charred broccoli by Chef Jeff Strom at Koho Bistro and then my friend Karen as we noshed while waiting for our bread to bake in her ovens. The char adds something special. It accentuates the bitter undertones and crisps up the little buds up top. If you can manage to pull off perfectly cooking the broccoli until crisp-tender but not sulfuric, chocolate brown but not thoroughly blackened, you’re good to go. I use broccoli raab, or rapini, or flowering broccoli in this recipe. If all you have is the regular stuff, just slice it longways very thinly, so it will cook relatively quickly, instead of breaking it into little florets. 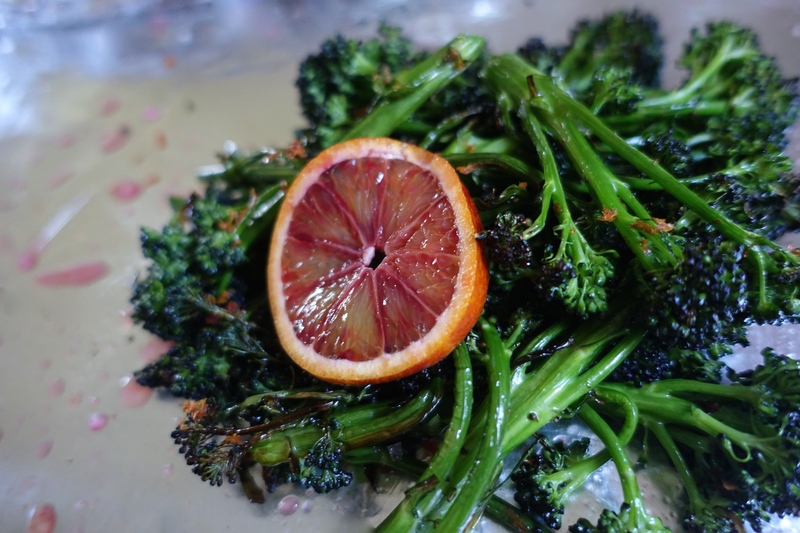 The blood orange juice adds a tiny bit of sweetness, as blood orange is really not the most flavorful of citrus, but the zest is absolutely wonderful and crucial for the recipe to work. More bitterness, more brightness, sunshine in February. Preheat broiler to high. Rinse vegetables if necessary. If using raab, separate stalks and trim any tough stems. Leave the little leaves, as they char nicely. If not using raab, slice broccoli thinly lengthwise. Toss with the olive oil and finishing salt in a mixing bowl, then arrange on a foil-covered cookie sheet. Broil until there are spots of dark char all over the raab, especially crisping up the tips. This may take from 3-7 minutes. The raab should be crisp tender. Zest the blood orange and juice one half of the orange, reserving the other half for garnish or another use. Remove from broiler and add the orange juice to the raab, then sprinkle on the zest. Toss to combine, making sure the zest is evenly distributed, and serve as a side with creamy savory dishes, like potatoes au gratin, or pork chops.